Mount Shasta lies smack-dab in-between Redding and the Oregon Border (about 60 miles North of Redding and 60 miles South of Oregon). It towers at an enormous 14,179ft over Siskiyou County at the south end of the Cascade Range, making it the 2nd highest peak in the Cascades and the 5th highest in California. On a crisp, clear day, Mt. Shasta can be seen from about 150 miles away. With its high elevation and mildly inclement weather, its glacier peak is snowcapped year-round. There are seven named glaciers, the four largest being Whitney, Bolam, Holtum and Wintun. Since 1820, Mt. Shasta has been a well-known landmark along the Siskiyou Trail. It has been an important literary & scientific subject since the 1860’s. Poet Joaquin Miller, author John Muir and even US President Theodore Roosevelt have commented on Mt. 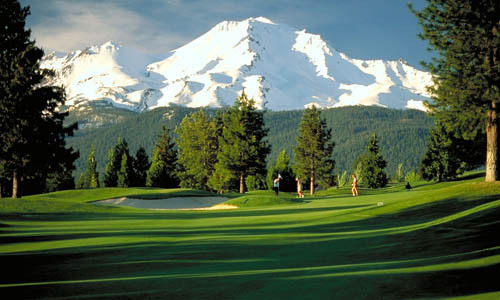 Shasta’s majestic beauty and towering heights. Theodore Roosevelt said, “I consider the evening twilight on Mt. Shasta one of the grandest sights I have ever witnessed”1. Though stunningly beautiful, it is also a dormant volcano that is predicted to erupt sometime within the next few centuries according to the US Geological Survey. The last recorded eruption was maybe two centuries ago (exact sighting has not been confirmed). Mount Shasta has a history of erupting on average every 600-800 years over the last 10,000 years. Mt. Shasta’s first recorded ascent was by Elias Pearce in 1854. Since then, Mt. Shasta has been conquered by many skilled and highly trained climbers. The most popular route is Avalanche Gulch which contains 6,300 feet of vertical gain and includes dangerous terrain and potential rock-fall. Only highly trained and skilled climbers with appropriate equipment are recommended to attempt Mt. Shasta and must be prepared for harsh conditions along the way. 1Roosevelt, Theodore 1858-1919. Letter to Harrie Cassie Best, dated Nov. 12, 1908, White House. In: James, George Wharton 1858-1923. Harry Cassie Best: Painter of the Yosemite Valley, California Oaks, and California Mountains. 1930? p. 18. Cited at Wikipedia.org. Retrieved 2012-05-17.